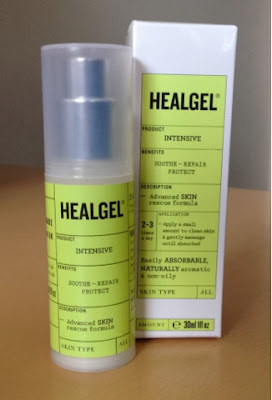 Healgel intensive is an advanced skin care rescue formula....its multi-active formula helps with a vast range of skin problems and a whole host of common skin complaints which can worsen as the months get colder, including dry, sensitive skin, eczema and psoriasis. This multi-tasking skincare staple is a great emergency repair for stressed dehydrated and itchy skin which can become exasperated by constantly changing temperatures indoors and out and the drying effects of central heating. Healgel has become an overnight hit with health experts.. The light gel is designed to deliver the active elements to areas where they are needed most..Skin is soothed..repaired and refined. I have really loved using Healgel its very light and left my skin feeling smooth and is a perfect make up base...I only needed a very small amount and the gel is was easily absorbed into the skin and didn't leave a oliy residue. I have been only using Healgel for a week now and my skin feels amazing, so I'm really looking forward to the long term results. HealGel Intensive can be purchased for £37.50 from the HealGel website.